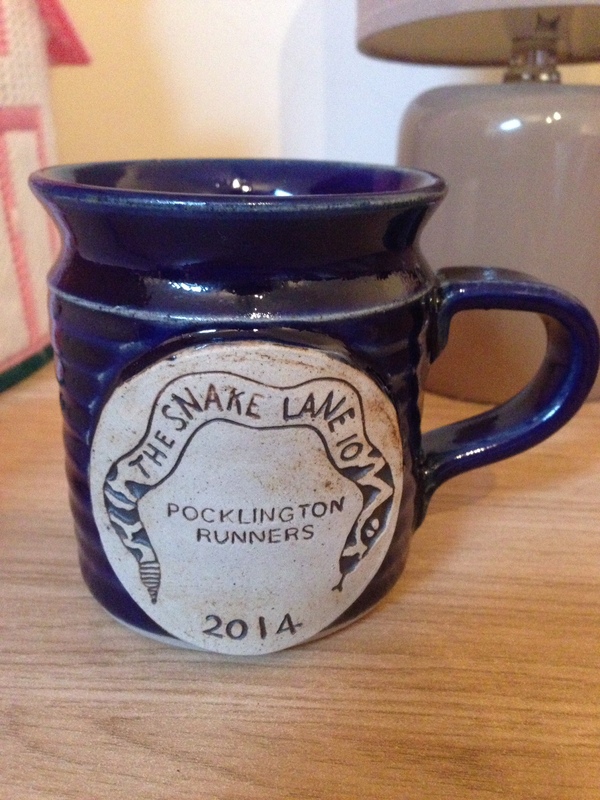 Sunday was the Snake Lane 10mi, hosted by Pocklington Runners. I had in mind to get a massive PB, but it all went very wrong. My current record at the distance is 1:38:46 from Harewood 10mi Trail last year, so I figured there would be a huge margin to knock off on a flat road race. Nope. 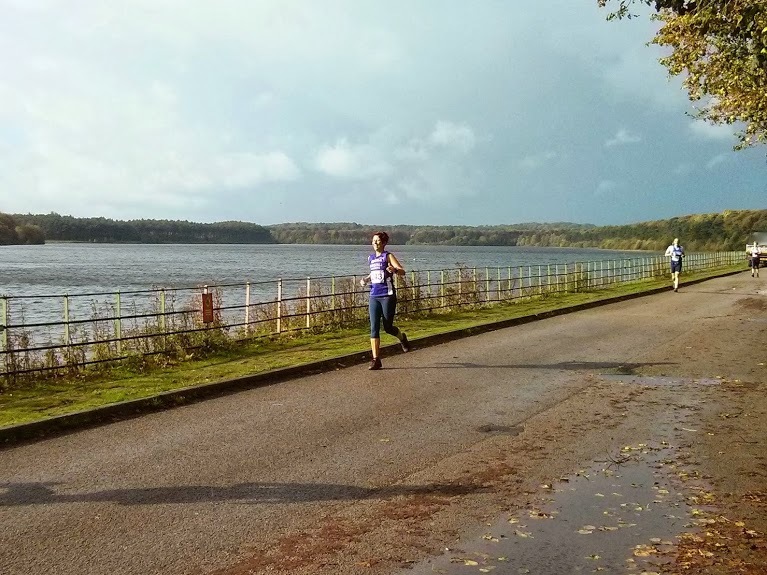 The temperature and the colour of the sky were pretty much perfect for a race, but the wind was a complete nightmare. 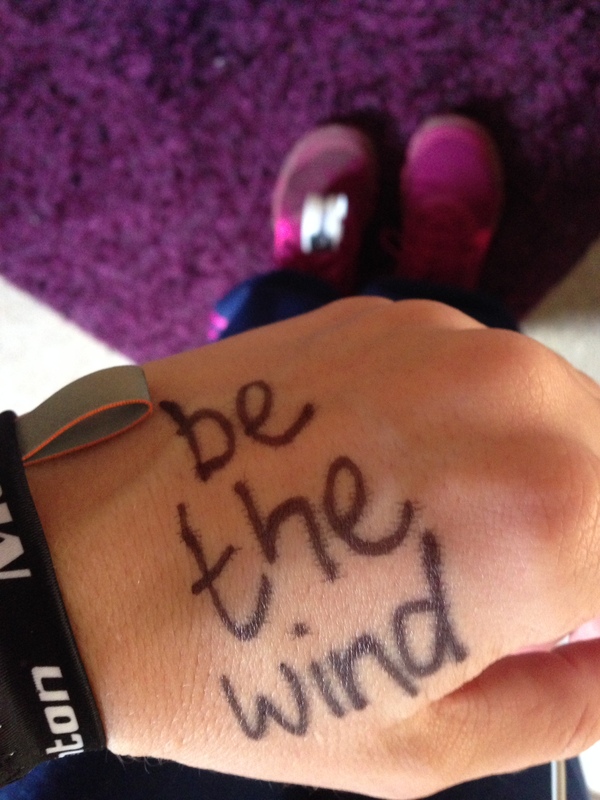 I wrote myself an appropriate race mantra. 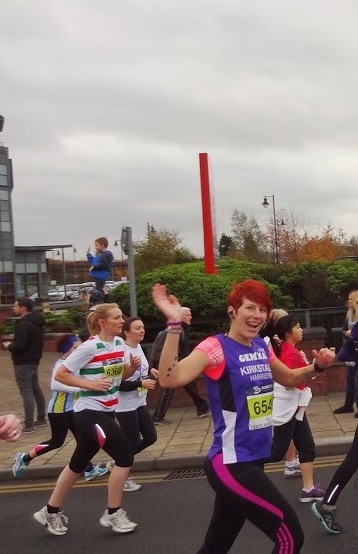 I went to the race with my good friends Vikki, Bethan and Jill and we had a lot of laughs along the way, not to mention much support for each other before, during and afterwards. The start was simple enough – off we went and settled in. Vikki was soon off, and although Jill, Bethan and I were targeting similar times they were ahead of me quite quickly. But not to worry, my first few miles were slower than the ultimate dream target but still good enough for a PB, so I just got on with it. Miles three to six were also steady enough and I was skipping along, but then the wind hit. As we wound our way through open fields we were blown in every direction. At times it was all I could do to stay upright and going forward, let alone get any speed going. 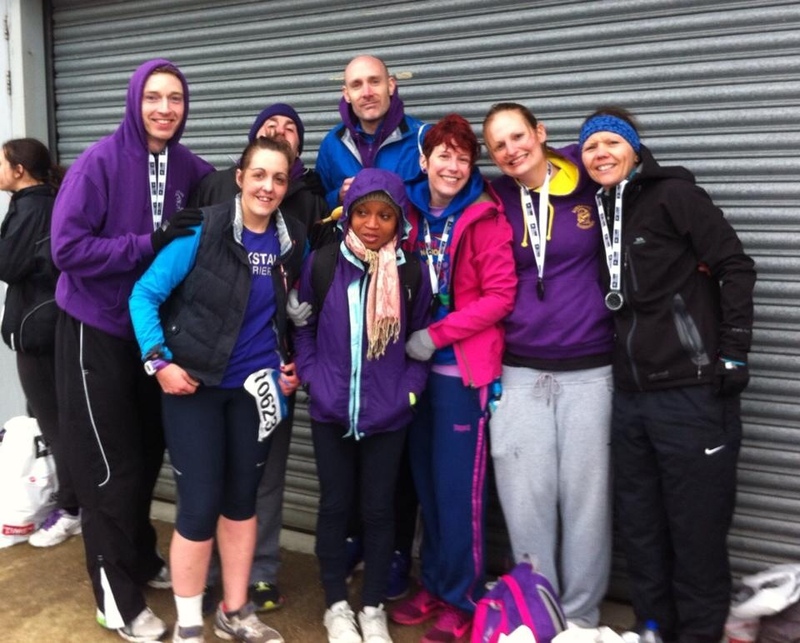 I quickly realised it was hopeless to keep thinking of a PB and I felt pretty awful. By mile 8 I had had enough and just wanted a cup of coffee and a sit down. I did a lot of meditating (my headphones had died by this point so no banging choons to distract me) and kept bringing myself back to my feet and my breath. I felt wonky and all over the place with the gales battering me, but I just had to keep going forward, no matter how slow the progress. I fought back tears in the final mile and, after what seemed like days, got to the finish line. It wasn’t quite a personal worst, but not far off. 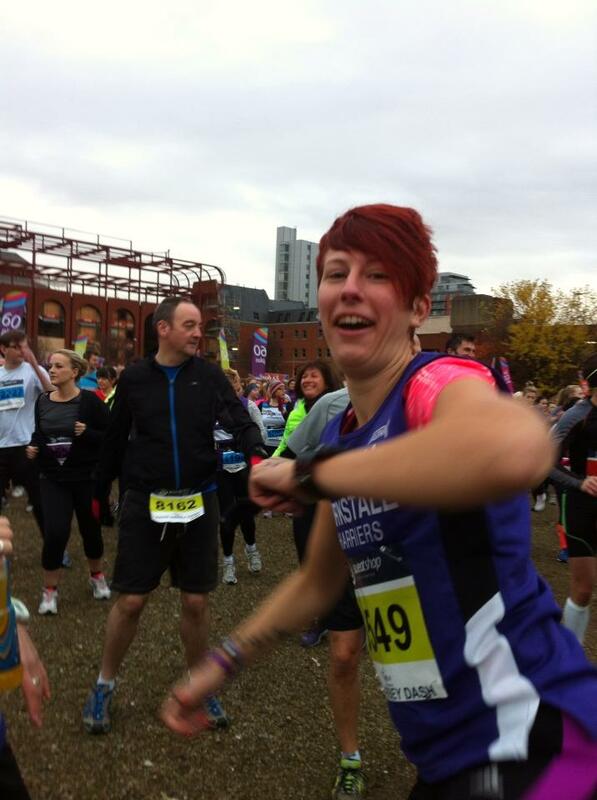 The course was fab and the marshals lovely, but whoever ordered wind is off my Christmas card list! I cheered myself up with a massive four-shot skinny hazelnut latte from the Costa and scoffed my peanut butter KitKat Chunky in about three mouthfuls. We all got a lovely mug as a memento and headed home looking quite disheveled! Once again I have to thank Jill for being an absolute rock. She kept looking back to check I was OK, and every time I got that thumbs-up I chuckled and felt a little better. I will definitely be back to tackle this one again, but hopefully the wind will stay away next year. 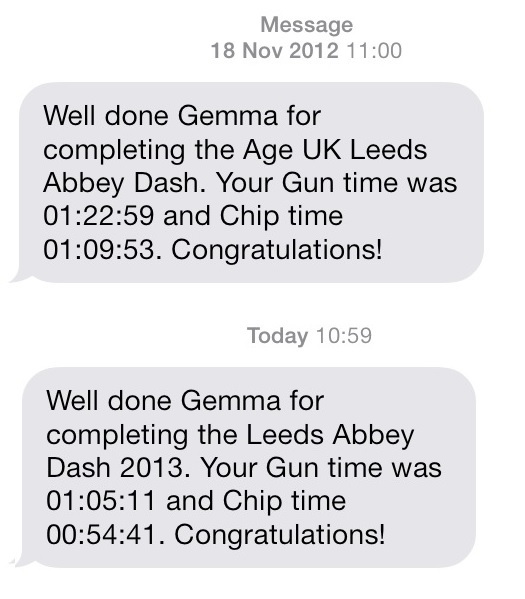 Sunday was the Leeds Abbey Dash – a 10k out-and-back road race that is flat, fast and perfect for PB chasers. 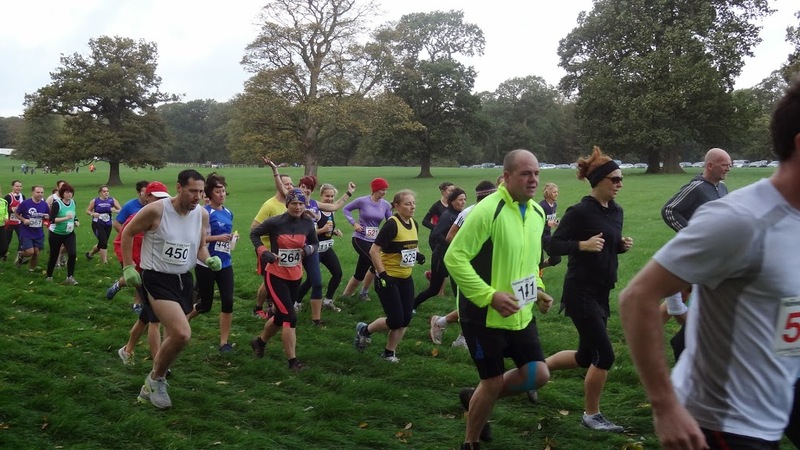 This was the second race I ever did last year and although I hadn’t really been that fussed about doing it again, circumstances conspired to take me to the start line. It’s fair to say it’s not the most exciting, interesting or picturesque race. It starts in the city, goes out along the A65 Kirkstall Road, turns round at the Abbey, and comes back again to finish at the Town Hall. The surface is good, the weather can be just right, and the support is pretty good for most of the way. 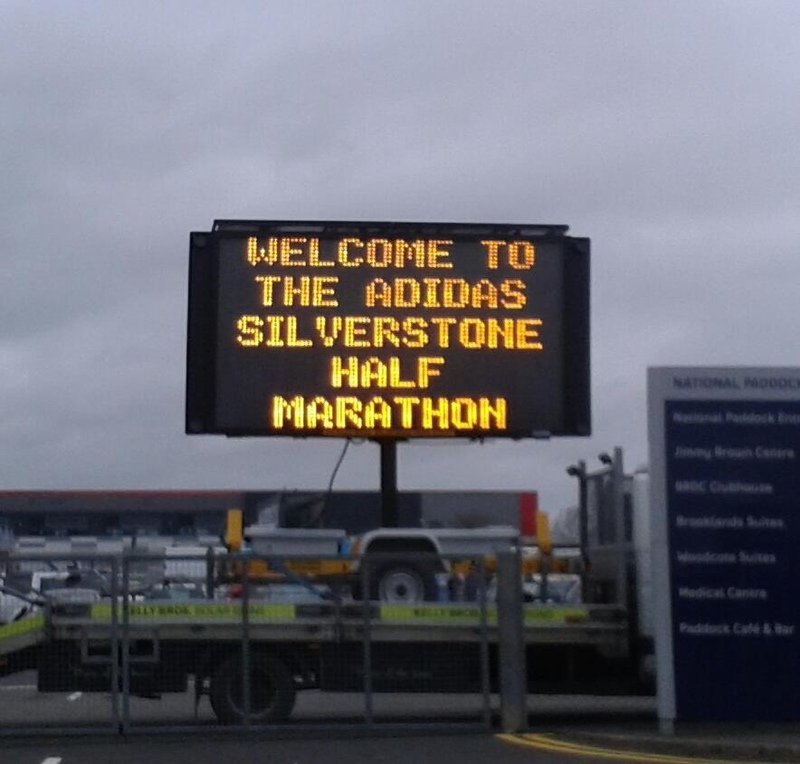 It is a massive race though – somewhere around 10,000 entrants I think – so can be a bit busy. When I got to town for the start last year I was cold, terrified and alone. This year I was cold, excited, and surrounded by friends. I also had the good wishes of all sorts of people, some I know in real life and many I don’t, going round my head. As you can see I was targeting an average of 8:51/mile to get me round in under 55 minutes, and I was fully expecting it to hurt. Before the start I chatted with some of my lovely Harrier friends and vented some of my excitement in the silly mass warm-up. The start was just behind Wellington Street this year, and apart from the walk from the baggage tent at the finish area, it worked well. The pens were clear for each time group and well separated, which meant everyone was in the right order and there wasn’t too much jostling along the run. It was chilly waiting around, but I don’t think it was as cold as last year. It was cloudy and there was no wind – absolutely perfect. I had made arrangements to run with my friend Graham from Harriers and his mate Kevin, who said he would pace us to a sub-55 finish. I couldn’t find them at the start though so I just had to set out alone. I did bump into my friend Karen though. 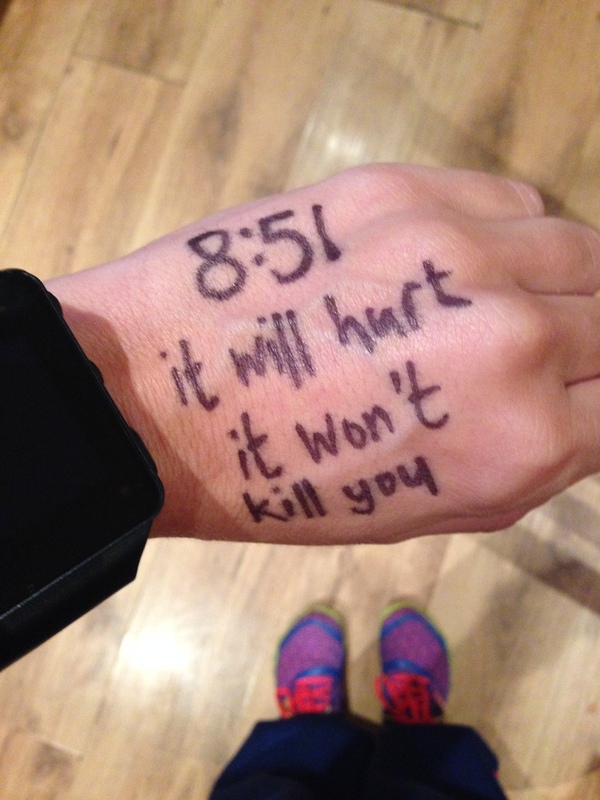 She also had a race mantra written on her hand. This made me laugh a lot. I went off without really having chance to think about things. I started running, checked my watch after quarter of a mile or so, was right on target so carried on. I could tell already it was going to be tough, but I just kept on putting one foot in front of the other at the same rate. Graham and Kevin came up behind me around the 2k mark, so then we stuck together pretty much the next few miles. The route had a little kink through Cardigan Fields leisure complex this year because of the different start, and that was a bit annoying, but apart from that it was up the A65 Kirkstall Road as usual. To the Abbey, turn round, grab a drink, and head back. The kink did mean that I missed seeing the leaders come back past, which was annoying, as I do enjoy cheering them on. I made it to 5k in 27:40, which was right to schedule, but was really feeling it by that stage. I knew the Harriers support crew were just down the road, and my friends were a little further on, so I just had to dig deep and keep going. 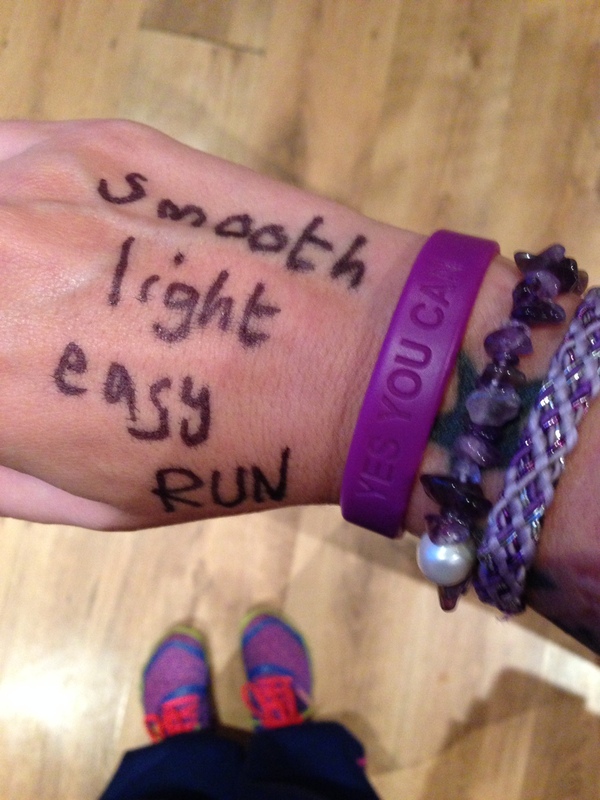 I kept checking my mantras and thinking about my form to get me through. 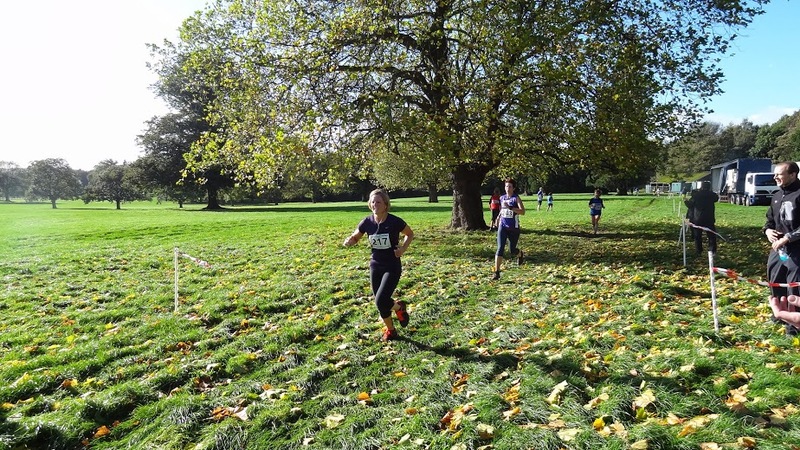 Most of the race from 2k to 7k is a bit of a blur – I think I just embraced the pain and went with it. The data shows that my pace was reasonably consistent, and my cadence stayed nice and high at around 176 steps/minute. 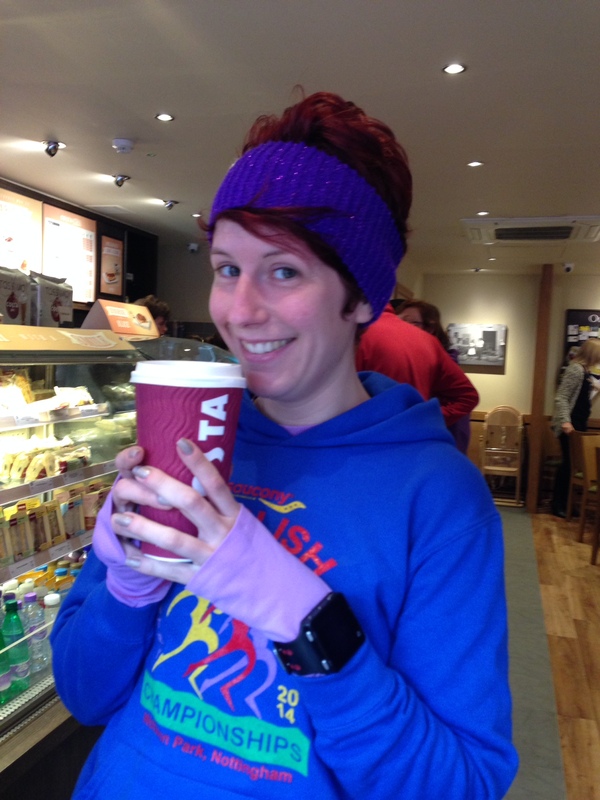 I happily told my non-running club friends that I hated them on the way past, and then when I got to Cafe Enzo, where Alix, Helen, Stevie and Sam go for brekkie and then to cheer, they weren’t even ready for me! No pom poms out or anything! I shouted at them to “look lively”, grabbed my water and sped off, shouting back that I did love them really! I hope this amused rather than annoyed my fellow runners. Now things were getting really tough. Kevin kept me honest, and as we got to 9k he dropped back to gee Graham along as my friend Shami had said she would be there for me at 9k. Shami is a little rocket. She had done her race (in 40:43) then walked back to help me through the last bit. It was much-needed and appreciated, and having Shami run alongside and shouting at me helped to keep me upright and going forward for the final few minutes. For once there was no real sprint finish. I had used up every single drop of energy and just managed a slight gear change thanks to a final talk with myself about running tall, strong and smooth. I passed a load of people in those final few minutes, got over the line and managed to not fall over. I crossed the line with absolutely nothing left in me. Chip time: 54:41. That’s a new PB by 1:16 and a massive improvement of 15:12 over the same race last year. Yes, more than 15 minutes quicker in 12 months of training. 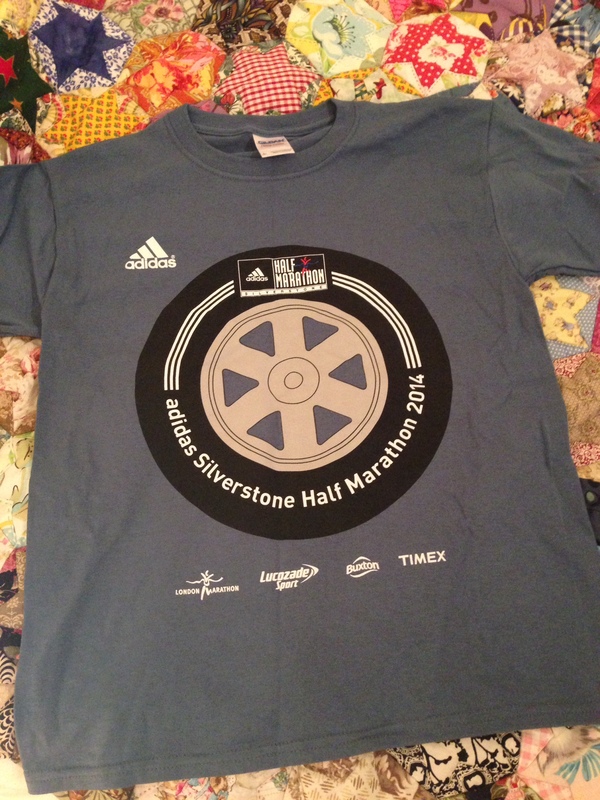 As soon as I got through to collect water and my tee there were friends everywhere smiling and congratulating me. It was fun to bump into so many happy and knackered people. I then went to the pub with the Harriers and recovered with a double gin and slim. Heaven! It really was a tough race – I felt on the limit with every single step. As one of my friends pointed out I maintained my current quickest 5k pace for twice the distance, which is no easy task. But this does mean that I should be able to get a quicker 5k done soon! A lot of people don’t like the Abbey Dash. It’s not pretty, and it’s not the cheapest. It’s busy and it can get a bit dull. But it is perfect for a PB attempt. And it is the first race I have done for two years in a row. Both of these things mean I’m going to have to keep doing it. And I do enjoy it, although my legs beg to differ. By the way, I do run normally most of the time, it’s just that I’m always so happy to see friends that I have to wave to them. 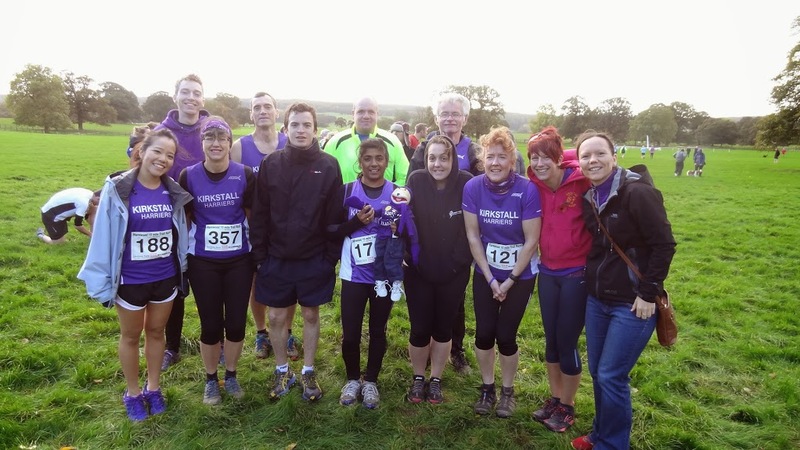 On Sunday I ran the Harewood Trail 10mile race, organised (superbly) by Valley Striders. 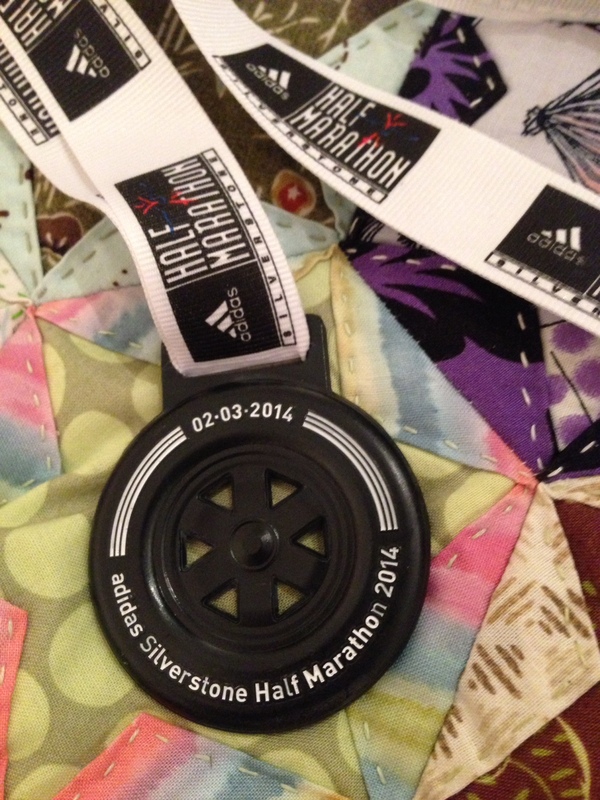 It has gone straight on to my list of all-time favourite races (one day I will do a post on the list). The day had dawned beautifully clear, but by the time we got to Harewood and met up with fellow runners it was very cold and very blustery. And then the rain came in. Sideways. Just as we crossed the start line. It was actually good fun, and there was nothing we could do about it anyway so I sucked it up and embraced it. We were soon in the forest and sheltered from the weather, and by the time we emerged it had stopped being quite so nasty. I mentioned in an earlier post that I was targeting (and got) a PB on this course, so I was a bit “head down, arse up” in my approach (that’s the biker chick in me coming out). 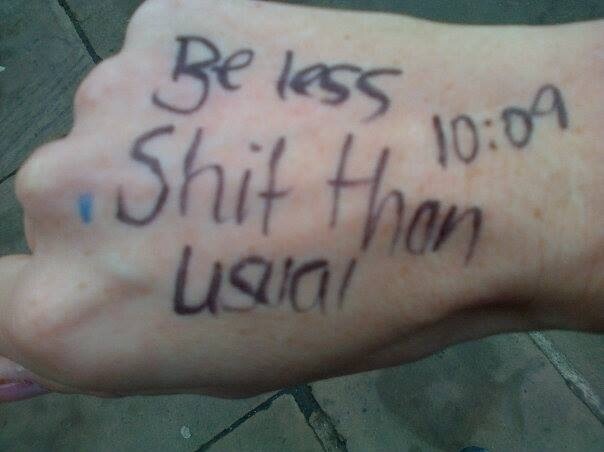 I wrote my goal paces on my hand along with the word “hips” to remind me to run up and tall. These notes, plus the stunning scenery and fun course, came together to create the ideal race, and I loved every single step. 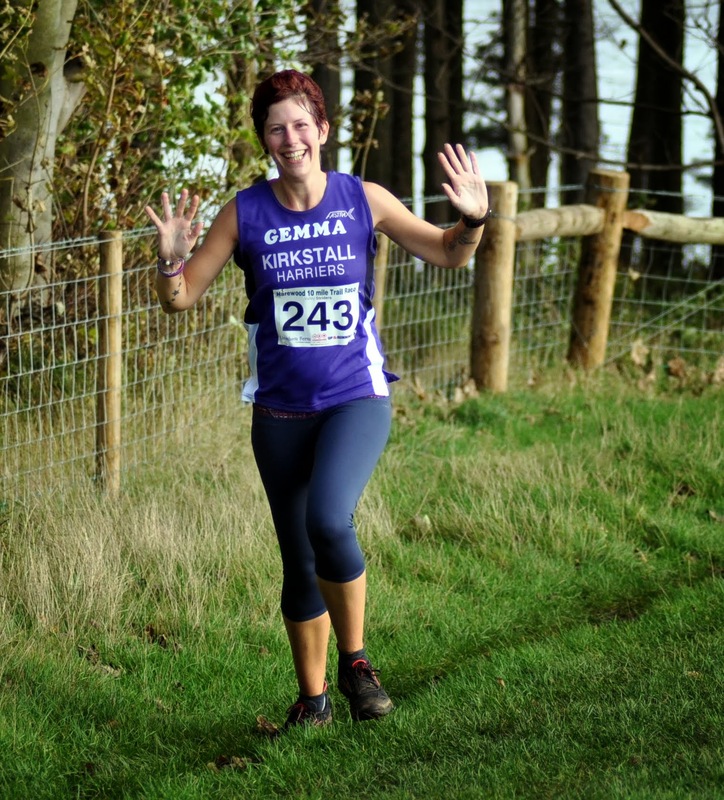 The route took us past Emmerdale, through some gloriously boggy fields and woodland paths, over a lamb skeleton, round Eccup reservoir, through cow fields and culminated in a couple of killer hills and, of course, a sprint finish on the grass. 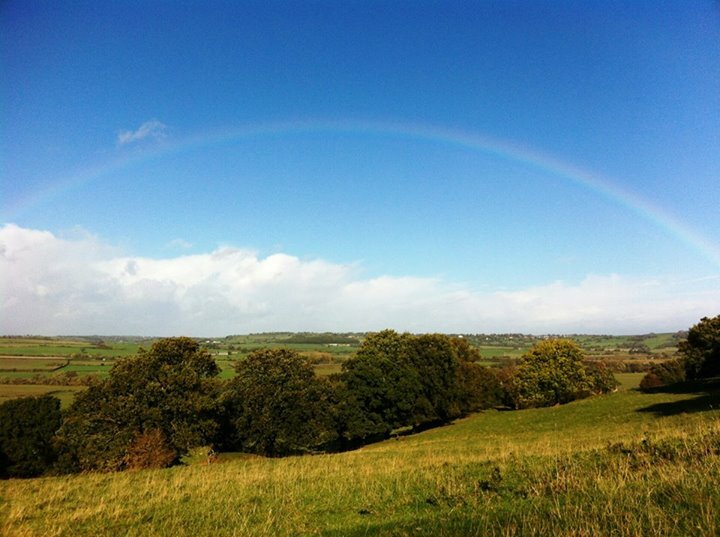 We got all four seasons in one race, plus a rainbow! 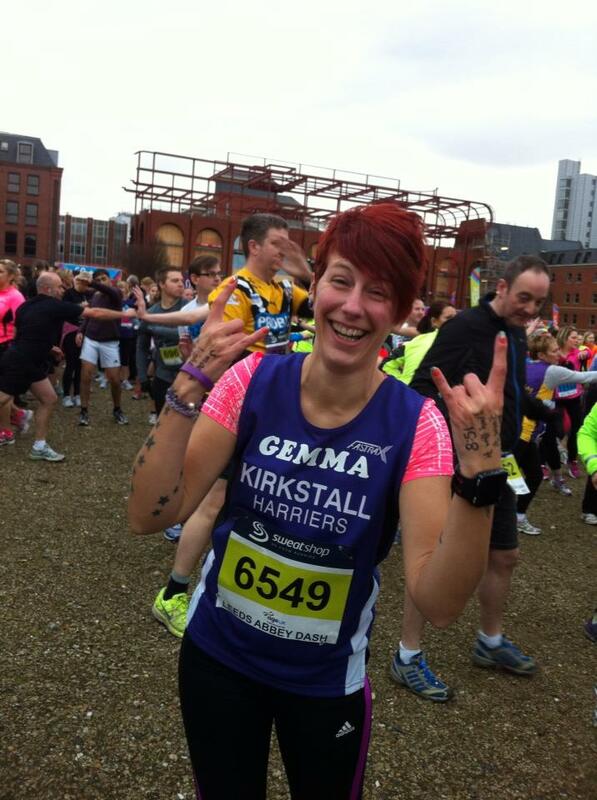 And I did get my PB despite the massive and varied challenges of the race, so overall a very good event! 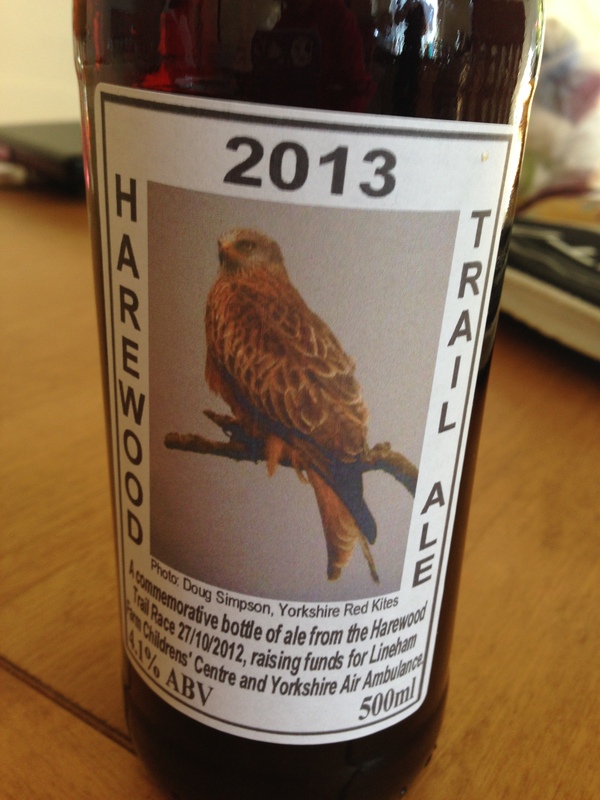 Oh, and the race memento was a bottle of ale. Which went down very nicely that afternoon. 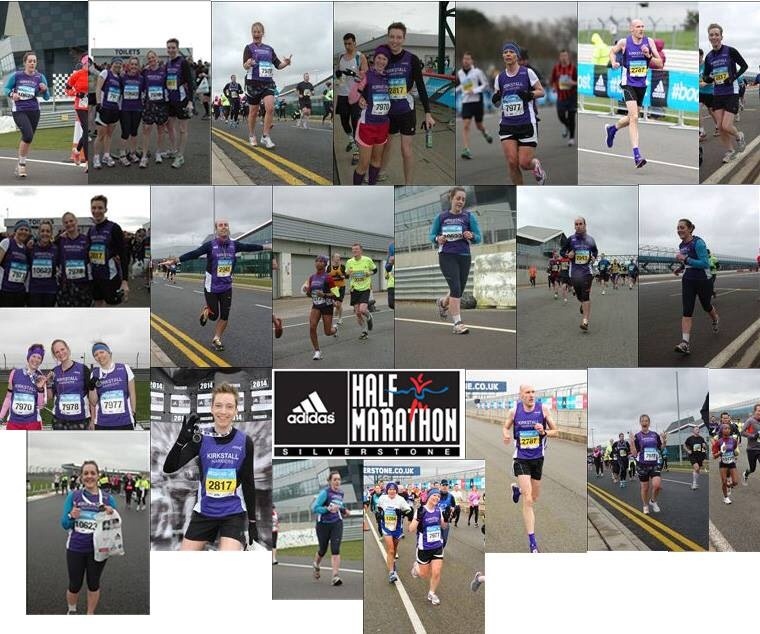 With thanks to my fellow Harriers and Andrew Thrippleton for photos. I took up running around 18 months ago, and my first road race was a year ago today. A lot has changed since then! 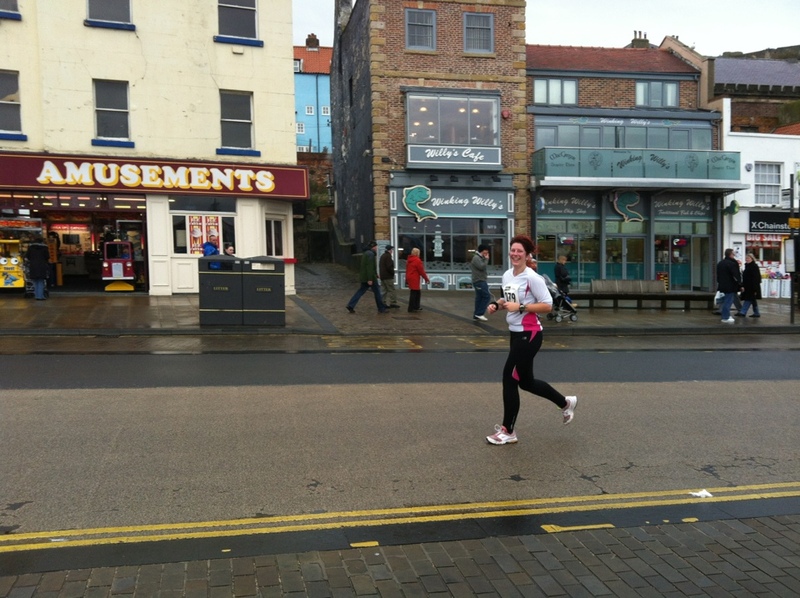 My inaugural race (not counting the Spartan Sprint in August as there was very little running and a lot more mud/climbing/crawling) was the Yorkshire Coast 10k in Scarborough. 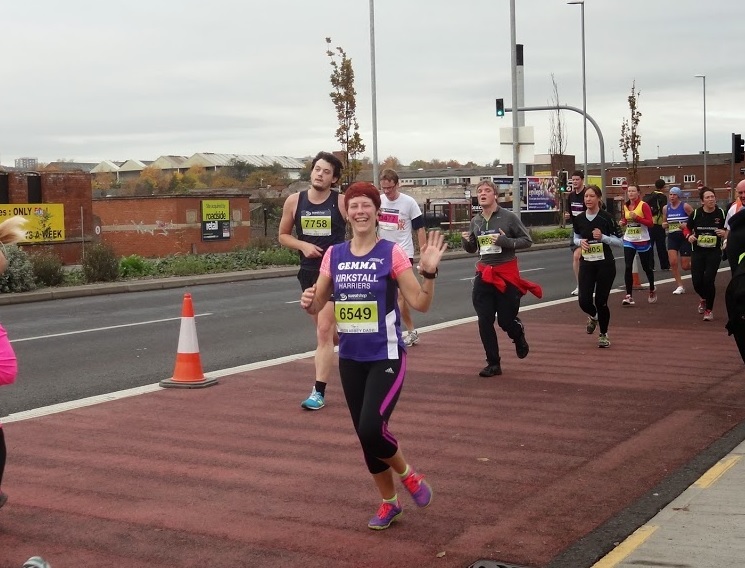 It was cold, damp and breezy and I was incredibly nervous, but it turned out to be great fun and afterwards I was immensely proud of myself (and bored Helen silly with a mile-by-mile review). I completed the race in 1:13:18. 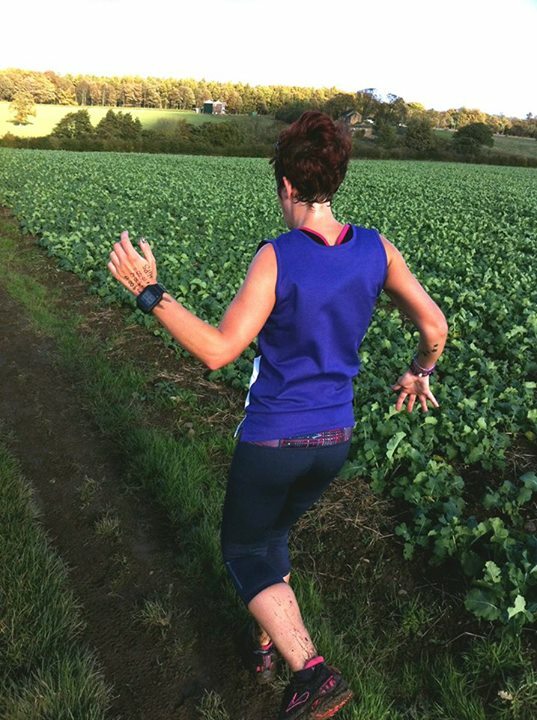 Since then I have improved a lot with my running, thanks to putting in some serious effort with training, joining Kirkstall Harriers and racing at almost every opportunity. 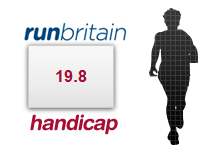 One of the ways I keep track of my progress is via the RunBritain Rankings handicap system. I don’t completely understand the mathematical formulae behind it, but essentially it’s a bit like a golf handicap – the lower the better. Each licensed race is given a difficulty rating depending on the course, weather, and so on. It then looks at your time in comparison to this and the other runners and decides whether you were quicker or slower than expected, given previous times. At least, I think that is how it works! 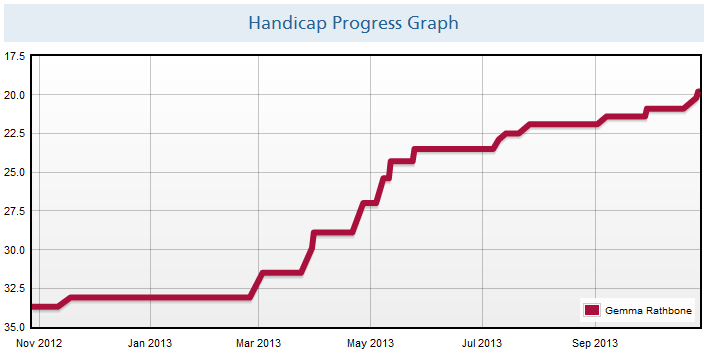 The point is this – as of October 28th 2012 my handicap was 33.7. This morning it is 19.8. That’s a reduction of 13.9 in 12 months. And a pretty graph. This seemed like a good opportunity to look at some very early stats too. A total of 2.33km, that’s around 1.45mi, in 22:46. As you can see I was going round and round the park next to my house. 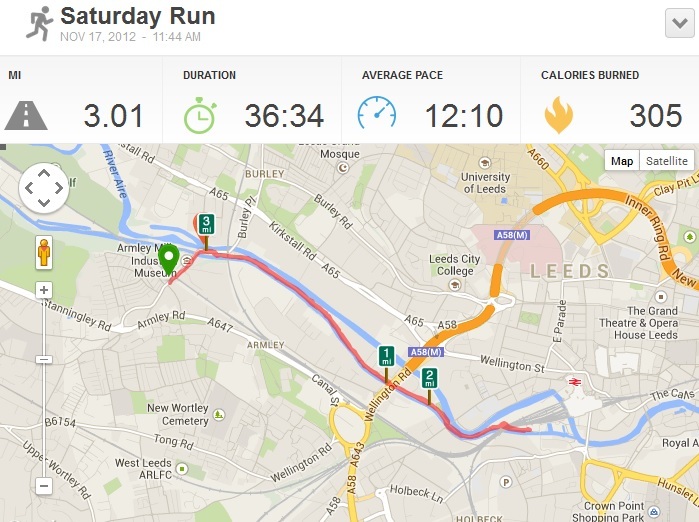 On July 31st 2012 I did 3km, 1.86mi, in 29:52. By this time I had begun to venture further afield and was running along the canal. My friend Alix would often come with me for a walk, and I’d loop back to her and report on how much further along the towpath I had got in the same time as a week before. As I reported yesterday, my parkrun (3.1mi) PB is now 26:44 – about 10 minutes quicker than a year ago. “They” say that new runners can expect several years of improvements before they level off, so here’s to plenty more stats and PBs!